Gone are the days of manually aligning powder diffraction capillary samples using goniometer heads! 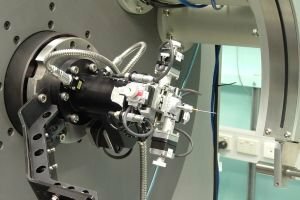 Many powder diffraction users will breathe a sigh of relief this round (2011/2) with the introduction of the beamline’s automated capillary alignment sample spinner. The ‘auto-spinner’ was developed in-house by a team led by Qinfen Gu and including David Wang, Terry Cornall, Mark Colclough and Allan Easdon. Researchers from Sydney University were the first to test-drive the auto-spinner and assist with the optimisation of the image-capture routines that are critical to the success of this sample mount. 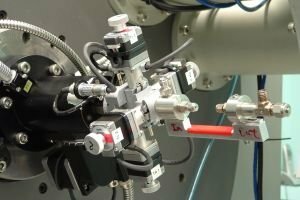 The auto-spinner uses magnetic bases to allow mounting of conventional capillary samples but the flexibility of the design means that it can also be used for convenient mounting of the beamline’s flow cell (left), making the auto-spinner easier to use and more accurate than the traditional sample mounting methods.